Brunch without the wait? Try the new Brother Joe in Georgetown or, for a cheap weekday fried-egg breakfast, hit Café Opla by the waterfront. Coffeehouses have evolved into serious breakfast spots, with eggs and even Bloody Mary buffets. They come with a kitchen staff cranking out hot subs and baked goods instead of relying on doughnuts and prepackaged grab-and-go food. Many are trying to make better use of their space. Allowing customers to turn a table into their own personal office may be a great community service, but it’s not exactly the best way to make a buck. Here’s a look at two new coffeehouses that serve lunch and brunch. Bonus: There’s no long wait on weekends. Located inside the World Trade Center, Café Opla sits across the street from the touristy side of Elliott Avenue. Prices drop precipitously on Café Opla’s side, where office workers and apartment dwellers congregate. The barista pulls a good Stumptown shot from La Marzocco; the dry cappuccino is indeed dry. Breakfast sandwich and banh mi range from $3-$7. Egg skillet dishes, the cafe’s specialty, run around $8.50-$10.50. It’s a multiethnic counter staff that echoes the multicultural menu. Breakfast is fried eggs served in a hot skillet with choice of proteins: The Korean version (short ribs and kimchi); Japan (chicken katsu); Hawaii (Spam and pulled pork). Each order is served with baguette. Pork two-ways, meatballs and grilled “thit nuong,” come with the Vietnamese egg skillet, an umami bomb of fish sauce, though the grilled meat was dry like jerky. Better was the Philippines egg skillet served with copious amounts of Longanisa-style sausage along with Café Opla’s signature pillowy meatballs. Banh mis taste fresher than those served in the Chinatown International District, a light and airy baguette with bright flavors and plenty of pickled, sweet-and-sour components. But the subs lacked the creamy texture of mayo. It’s one of the cheaper lunch and breakfast options along the waterfront. The bill: Two fried-egg skillet breakfasts ($10.50 each), a pulled-pork banh mi ($5.95) and a cappuccino ($3.75) totaled $30.70, before tax, enough to feed two to three customers. It’s the usual sandwiches, wraps and salads you would find on the ground floor of downtown office towers — though the food is a couple notches better here. Sandwiches ($11-$14) are substantial and come with a salad; an order is enough to feed two as a light lunch. On weekends, brunch is on, and couples with baby strollers and the hungover set hang here. Its menu, a mix of Southern and New American brunch items, runs two to three bucks cheaper than what you would find on Capitol Hill and in Ballard (most dishes range from $8 to $13). 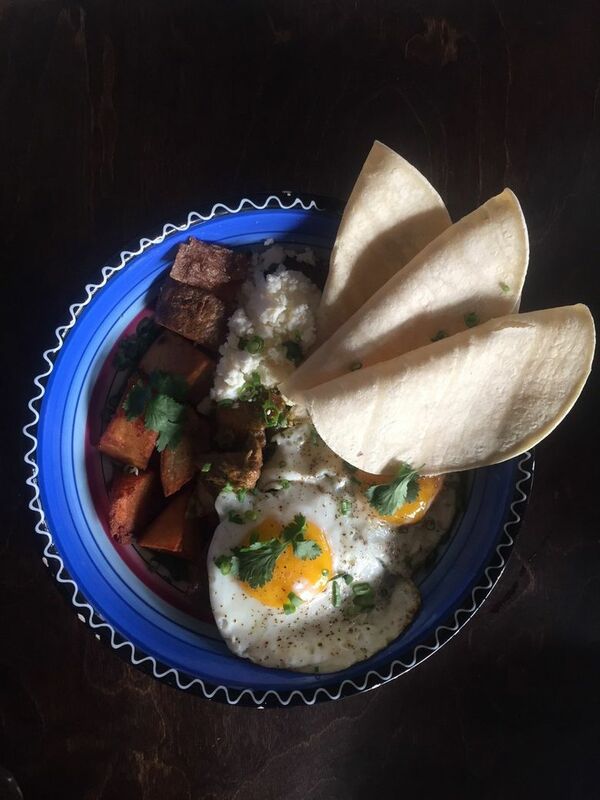 The New Mexican-inspired brunch ($11) features chunks and ribbons of pork braised with Hatch chile peppers, served with roasted potatoes and topped with two sunny-side-up eggs and warm tortillas, a hearty meal. Even cheaper, its breakfast cake (two for $9), a cross between a coffee cake and a Dutch baby, eggy and buttery, and here given the pancake treatment — drenched with maple syrup, dusted with powdered sugar and topped with granola and fresh strawberries, blueberries and peaches. It’s a sugary, carb-coma best washed down with copious amounts of Herkimer coffee. Mushy rice marred its porky take on Loco Moco. Its Bloody-Mary-and-mimosa bar (three drinks for only $13) has dozens of toppings: Cajun shrimp, pickled veggies and various Tobasco sauces, though, as a couple of customers noticed, no bacon as advertised on the Bloody Mary garnish list. The bill: A Vietnamese egg coffee ($3), a drip coffee ($2.25), a Bloody Mary ($5), a “Kalua Pork Loco Puerco” ($12) breakfast, chile-verde pork with fried eggs ($11) and “Fluffy Cakes” ($9) totaled $42.25, before tax, enough to feed two to three people.